The bad guys just got a new reason to fear the night! When Gotham’s criminals run wild, nothing gets them shaking in their boots like the sight of Batman…even a pint-sized version! A poor little rich kid name Bruce Wayne by day, this masked avenger comes out at night to protect the innocent civilians of Gotham from the same kind criminal evil that took his parents away. Armed with the latest technology to help fight crime, he’s also got a loyal and protective butler, Alfred Pennyworth (who, it’s rumored, is also a former agent of the MI-6) and a trusty sidekick Robin to be the air under his bat wings. And make no mistake…though he is fueled by a tragic childhood, his quest is not for blind revenge…when it comes to protecting his city, Batman lives by a higher code, the code of a true (dark) knight! Which is all to say: What a cool guy! 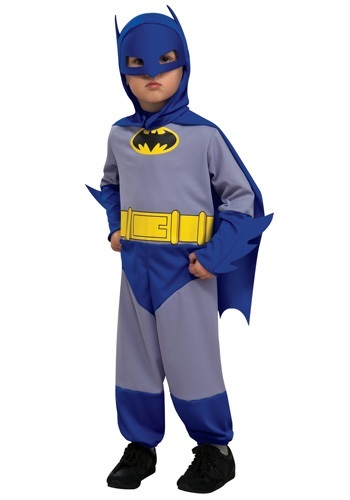 But in order to do the job of Gotham’s greatest hero, your little cutie is going to need the right costume…and that’s where this Infant / Toddler Batman Costume comes in! Licensed from Batman: The Brave and the Bold, one look at that gold symbol on this caped bat-suit and all the bad guys will know that they just messed with the wrong hero! Armed with a trusty yellow utility belt, your little Bruce Wayne will be able to put down even the deadliest of villains and still be home in time for dinner! We chose this for our son's birthday (he is a very small 3 year old) - the size would suit an average 2 year old and our son loved dressing up as batman. However I wouldn't recommend this outfit as I think it is poorly made. 1) it's made from really flimsy material 2) the velcro strips to hold the mask onto the costume on our outfit were wrong so it couldn't clip on. 3)The seams on the arms were ripping as soon as he put the outfit on. We were given a refund though, so I was pleased with the customer services!